Bonded composite repairs are efficient and cost effective means of repairing cracks and corrosion grind-out cavity in metallic structures, and composite structures sustained impact and ballistic damages, especially in aircraft structures. This book grew out of the recent research conducted at the Boeing Company and the Defence Science and Technology Organisation (DSTO, Australia) over the past ten years. 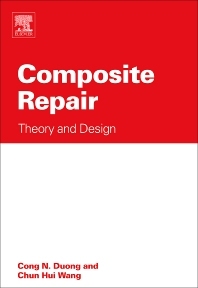 Consequently it is predominately a compilation of the work by the authors and their colleagues at these two organizations on the design and analysis of composite repairs. Composite Repair is entirely devoted to the design and analysis of bonded repairs, focusing on the mathematical techniques and analysis approaches that are critical to the successful implementation of bonded repairs. The topics addressed are presentated in a sufficiently self-explanatory manner, and serve as a state-of-the-art reference guide to engineers, scientists, researchers and practitioners interested in the underpinning design methodology and the modelling of composite repairs. Covering a variety of topics and effects: repairs of fatigue and sonic fatigue cracks, and corrosion grind-out cavity, and effects of secondary bending, octagon-shaped patches, thermal residual stresses, patches in proximity, patch tapering edge, etc. For university, federal government institution (FAA Technical Center, NASA, AF Research Lab, maintenance depot) and aircraft manufacturer libraries. Also suitable for engineers, scientists and researchers working in the field from university, government agencies, aircraft manufacturers, aircraft maintenance facilities and depots. Dr. Cong Duong received a B.S. degree in Aerospace Engineering from California Polytechnic State University, Pomona (1984), a S.M. degree in Aeronautics and Astronautics from Massachusetts Institute of Technology (1986), and a Ph.D. in Applied Mechanics from California Institute of Technology (1994). He is currently an Associated Technical Fellow of the Boeing Company where he has been working in the durability and damage tolerance group for sixteen years. From 1999-2005, he was a principal investigator of the USAF funded Composite Repair of Aircraft Structures (CRAS) program. Under that program, he had developed and implemented analytical and computational methods for design and analysis of bonded repairs over metallic aircraft structures. He is currently developing analytical methods for determining the allowable damage limits and the allowable repair limits on airframe of the new Boeing 787. He has published about twenty papers in peer-review journals, mostly on the subjects of bonded repairs, bonded joints and fracture mechanics. Dr. Chun Wang is a Principal Research Scientist and the Head of Composite and Low-Observable Structures in the Air Vehicles Division, DSTO, Australia. He has a PhD in Mechanical Engineering from the University of Sheffield, UK. Prior to joining DSTO in 1995, he held academic positions at the University of Sheffield (UK), the University of Sydney (Australia) and Deakin University (Australia). His main research expertises are in the areas of fatigue and fracture mechanics, composite structures, bonded structural repairs, and scattering of acoustic and electromagnetic waves. He has published over eighty journal articles and book chapters, and over eighty conference papers.